ROCHESTER, N.Y., December 12, 2018	(Newswire.com) - Etonic, a leading manufacturer of golf shoes, apparel and gloves – announced today that it has signed John Daly to a long-term agreement to exclusively play and promote its line of golf shoes. Daly, whose career includes 18 wins including two PGA Tour Major Championships, selected the iconic Etonic Stabilizer shoes after testing out a wide range of options from industry-leading brands. 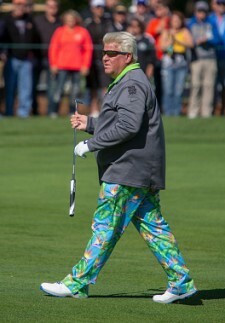 "Comfort and performance are what any golfer looks for in a shoe and Etonic provides me with exactly that," said Daly. "It's easy to tell Etonic shoes are a step above the competition." Comfort and performance are what any golfer looks for in a shoe and Etonic provides me with exactly that. It's easy to tell Etonic shoes are a step above the competition. "We're excited to welcome John to the team," stated John Holst, VP of sales for Etonic Golf. "He's been winning golf tournaments at the highest possible level for years, so to have him select Etonic over our competitors is quite the honor." With the help of Daly, Etonic has expanded its 2019 line of golf equipment which will provide golfers with a larger, more affordable selection of golf shoes, apparel and gloves than ever before. In 1876, Charles A. Eaton, the man who inspired the Etonic name, opened his first shoe factory in Brockton, Massachusetts. In 1945, Etonic produced the first golf-specific shoe and by 1950, well over 100 PGA and LPGA professionals were wearing the "Tournament of Champions" line of Etonic shoes. Throughout the years, Etonic has continued to achieve recognition for its footwear throughout the entire sports industry. Etonic continues to follow its commitment to athletes around the world by producing industry-leading activewear that allows them to achieve their best while feeling their best. Find out more at www.EtonicGolf.com. Etonic Golf follows it's commitment to golfers around the world by producing industry leading golf shoes, gloves and apparel that allow you to achieve your best while feeling your best.